Kirsten Jense is a Cuddlist-in-Training. This is an excerpt with translation of her blog post from her business website. My wish was always that connection and platonic touch would be accessible and available to everyone; and well trained, sweet, and cuddly coaches are needed for that to be accomplished! Do you have the idea to become a professional cuddler or cuddle coach yourself? Do you want to start from a professional basis? Then I advise you to follow this thorough and reliable training. I let myself train at cuddlist.com and I am very satisfied. Read more about my experience below and why professional training is needed. As a professional, it is critical to know what is necessary to create a safe and professional setting for your potential clients and yourself. Without strong training around boundaries, this can harm you and your clients! If you want to offer the right support to your clients, it is critical to work expertly without running the risk of harming yourself or others. Professional cuddling therapy is an intimate and vulnerable branch of work and you often have to deal with sensitive and sometimes vulnerable people. Good training, in which the importance of expertise, sincere attention, boundaries, and communication have priority, is necessary. Professional cuddling therapy finds its origins in America and the importance of cuddling and the health benefits are thoroughly researched and proven here. 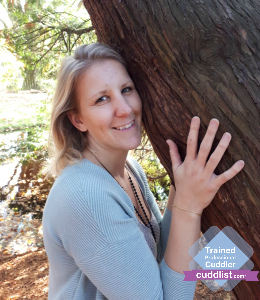 I myself went looking for a good substantive training and decided on cuddlist.com. Cuddlist.com has been at the top of the professional hugging world in America for several years and is a recognized and reliable organization. They offer cuddle training worldwide, in addition to a great platform for professionals and clients. The training can be followed online and is therefore easily accessible. You get a lot of personal support and feedback and the training I have experienced as very valuable and relevant. If you want more information about Cuddlist or this training, you can check out www.cuddlist.com.